The Swati Nakshatra is represented in the cosmos by a single star known as Arcturus. The protector of bears, Arcturus is the 3rd brightest object in the night sky. Governed by the god of wind, Vayu and the planet Rahu the Swati Nakshatra is symbolized by a green shoot waving in the wind. 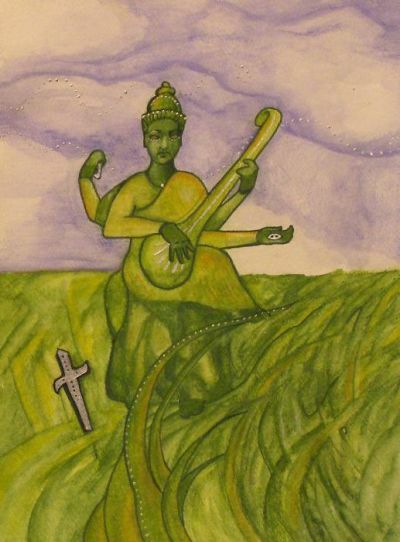 Unlike many of her sister Nakshatras, the Swati Nakshatra is immortalized by a single star, Arcturus. A central star in the Bootes constellation, Arcturus is also known as ‘the guardian of the bear’. It sits between the feet of the 2 bears, Ursa Major and Ursa Minor. The waving shoot suggests the forceful and airy qualities associated with the Swati Nakshatra. Governed by Vayu, the god of wind and the malefic planet Rahu, the native needs to cultivate their hidden talents to enjoy true happiness and success. The Swati birth star is said to have a cutting approach to communication and as such a sword is also used to symbolize this Nakshatra. The natives are resilient and determined people capable of great achievements. If they are out of balance for extended periods, they begin to feel restless, uneasy and become sensitive to noise. Strong-minded people, the natives of Swati Nakshatra possess great inner strength and tend to be stubborn in their ways. They are a wise and independent group who require a lot of personal freedom. 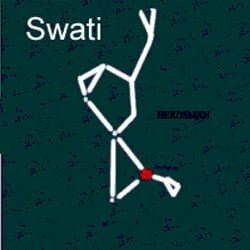 Generally intelligent, the Swati person has a pleasant sense of humour and is able to manage their ego better than most. These people make humble companions. Relatively attractive people, they have pleasing and unique facial features. They tend to carry a little bit of extra weight and the males may become quite heavy over time. These are very free-thinking independent people.They covet personal freedom, peace, love and happiness. Inherently honest, they have strict morals and rarely find themselves envious of others. Non-judgmental, they avoid assumptions and say what they mean. Sensitive beings, they don’t deal with criticism well and are relatively easy to upset. Hard workers, they will accomplish many great things. These people are found to excel in the areas of mining, pharmaceuticals, entertainment, textiles, mathematics and mechanical engineering. Many Swati natives work in the criminal system, where they are driven to obtain judicial roles. These natives also tend to work in social services as they are very group oriented. For a variety of reasons, the Swati will have difficult relationships with one or both parents. As children, the Swati are known to bear great responsibilities. Their contributions to the family are often overlooked and many will be criticized for their efforts. Their marriages may lack satisfaction, yet their need for stability, and sense of loyalty will often keep them in such relationships indefinitely. They are blessed with good health and a relevantly stress free life. The Swati may experience intermittent gastric problems, arthritis and heart disease. They are also known to have oddly formed feet and ankles which may cause ongoing issues. Previous What Is The Throat Chakra?